Prominent & Leading Wholesaler from Mohali, we offer herbal supplements, herbal malt preparation, ayurvedic malt preparation and herbal food supplement. Provides all essential nutrients, impart fresh energy,prevent disease,strength immunity,improves bone quality,it makes the energetic reduce mental fatigue, relives general debilty and use as a tonic around the for all age group. 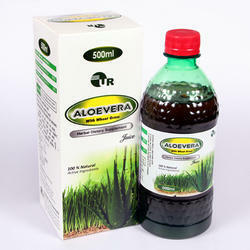 It is an herbal health drink. It contains aswagandha and shatavari which rasayn drugs ageing and to weight gain. It contains shankpuspi which enhance memory and other cognitive function properly. Growth of all parts of the body, balanced weight & appropriate height are necessary for energy, charming, smart & attractive young man & lady. These three features improve their personality. According to the Ayurveda, there are medicines which are ingredients of ‘UNIGRAIN Malt’ are effective in giving fitness & swiftness to the body. UNIGRAIN Malt not only gives energy to the body but also get rid of tiredness & weakness for the whole day. Take 1 or 2 teaspoon full of ‘UNIGRAIN Malt‘ in the morning & the evening with the glass of milk or fresh juice for a month or as directed by the physician. ‘UNIGRAIN Malt’ can also be given to kids as jam spread as 1 or 2 teaspoons over the piece of bread or paratha as per their choice. UNIGRAIN Malt is a complete Ayurvedic preparation from rare Herbs which is completely harmless on your skin & body. 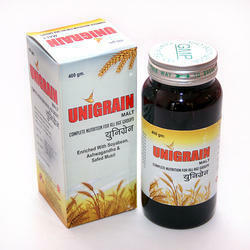 UNIGRAIN Malt is effective in giving fitness & swiftness to the body. It strengthens bones, improves blood and increases appetite.